Did you know that most inks are not made of one but many colours? In this experiment we blend art with science and make a batch of pretty flutterbies! Use the felt-tip or whiteboard pens to draw some lines and dots at the base of the filter paper on both sides. It's a good idea to write in faint pencil underneath what colours you used. Put the filter paper in very shallow water and watch. What happens? Take the filter paper out and put it somewhere to dry. Try drawing some patterns and using different colours - what works best? Once you've got a few filter papers done and fully dry again, grab your craft materials. 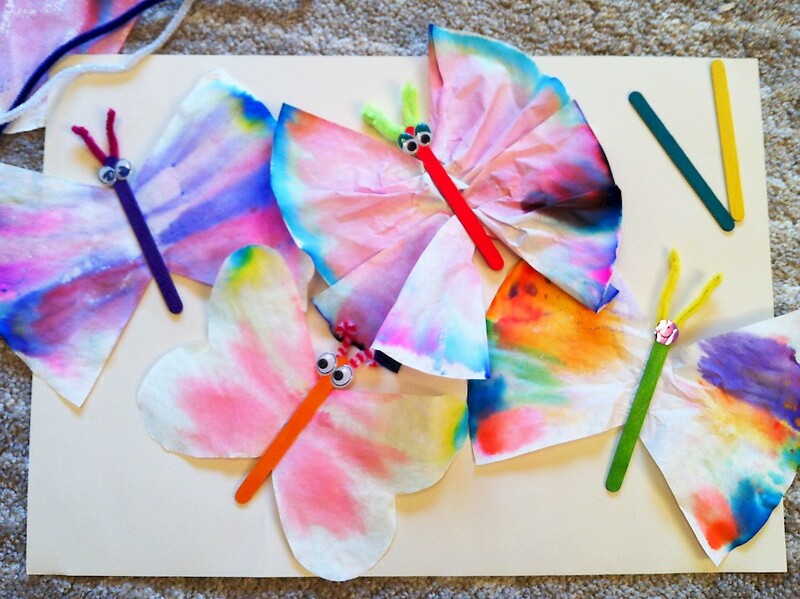 Cut the edges off the filter papers to open them out and make some chromatography butterflies! The ink in your pens often isn't a single colour, but is made of several colourful chemicals that we are separating out again. When the water soaks into the filter paper by capillary action, it dissolves and carries some of the ink molecules with it. The bigger, heavier molecules in the ink don't move as far as the smaller, lighter ones so they move with the water at different speeds and settle in different places as the water travels upwards. You will probably find that the darker inks like black and brown work best because they tend to be made of many more colours. This is the basis of paper chromatography, which is one of the most useful techniques chemists have to separate chemicals from a mixture! Used permanent markers in place of felt-tip or whiteboard pens? Used cooking oil instead of water? Made the paper wet at the top and bottom at the same time? Used pens of different brands? 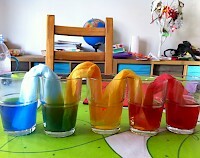 Colourful water goes for a stroll up out of one glass and into another in this incredible experiment! Can coloured water really step out of a glass and into another? What forces could be at work in this experiment that let water defy gravity and common sense? 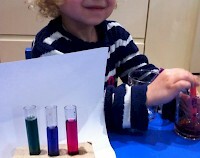 Colourfully detect the pH of stuff with red cabbage juice! Different stuff around us (and in us!) tends to be acidic, neutral or basic. In this spectacular colour-changing experiment we test a few liquids for their pH. Make sweet interlocking paper hearts from Möbius strips! Advanced activity. 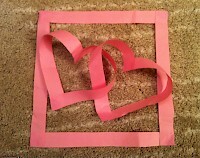 By cutting, gluing and cutting some more we're going to make a pair of pretty Valentine's interlocking hearts! This experiment might get messy or be a stain risk - use appropriate safety wear, cover surfaces, and be careful. This experiment might involve something sharp or breakable - use appropriate safety wear and be careful. Adult supervision must be provided at all times. © 2019, Small Science Club. All rights reserved.